Well, once you’re brought into this world, once you exit that wonderful cocoon of the womb and we enter this harsh planet Earth environment, well, guess what… you’re no different than that movie The Martian. Here you are, a baby inside of the womb, you were tethered to the placenta through your umbilical cord, everything was on demand: nutrients on demand, essential nutrients, the fats and proteins I mentioned before, fats and proteins, even your air supply. Nerve supply too – there’s an interchange of the mother’s nerve supply interfacing with the baby’s nerve supply, without either of them having that, the ability for that baby to grow in the womb is compromised. So all those essential requirements for that baby to develop have to be maintained throughout life. But what happens is you go from this wonderful environment, where everything is perfect, the sounds are muffled, the lights are muffled, and then okay, when the due date arrives, what happens? You’re exposed to bright lights, you’re exposed to different temperatures that might be 20 degrees less that you’re exposed to in a womb. Sounds are very loud now and all of the sudden wow, and then within minutes or seconds, you get your life line severed. You’ve lost that tether that’s been your life line from the time of conception. It’s rather traumatic. What we’re getting at is this: early on, babies express a challenge with transitioning from the womb to the world. We call that a colic. You’re transitioning from this food coming directly into your system, like a feeder line or a feeder tube. Right into your body, air, nutrients, waste is exchanged through this tube called your umbilical cord. Well, now you have to do it through the oral cavity, get your nutrients. Now you have to expel it through your own digestive track. Now your lungs have to work. So in this transition, sometimes there’s distress. And that’s where chiropractic can make a difference. A colic baby is a baby who’s nerve system has been somewhat stressed out by that transition from the womb to the world. The job of the chiropractor is to restore the continuity of the spinal bone so the energy can flow and you’ll see these babies mellow out immediately because you’re affecting the autonomic nerve system. When you have a colicky baby, what we do in chiropractic is we adjust the cause, they just melt on the table, I lay the baby on their mom and I just take very gentle thumb contacts near the skull, near the sacral, low back area, I use my hands, I use a gentle instrument called an ArthroStim. It’s a little woodpecker, 12 pulses in a second’s time, that is the fraction’s of an ounce. Just tapping and opening up those nerve channels, activating motion. These babies just melt. That’s what the chiropractic does, it activates energy. 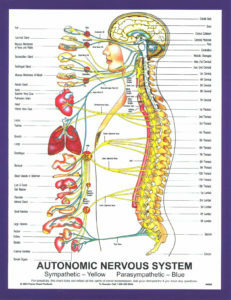 This chart over here, the autonomic nerve system chart, it’s all about the autonomics, the balance between the throttle up, and the throttle down, divisions of your nerve system that runs the show without you thinking about it. 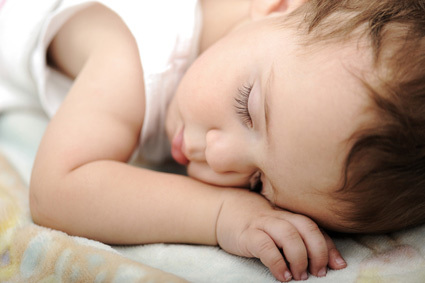 The next time you have or encounter someone with a colicky baby, all it is it’s a difficulty with transition. And your nerve system accommodates and adapts you to every stress you will ever encounter in your life. But the chiropractic adjustment restores balance, and potential, full potential to that nerve system so that baby can express health and adapt on this planet earth. A baby that’s colicky that doesn’t get addressed is likely to have other issues as well down the road, so you owe it to everyone you talk to, if you have a colic baby, have them check out a chiropractor to adjust the spine.